The easiest way to describe this is that every guest receives the same bar. (a good example is the Bride & Groom's name on the front with the date, thank you message on the back). These are silver foil bars, printed onto white gloss paper and are priced at £1.85 each (without cellophane gift sleeves). 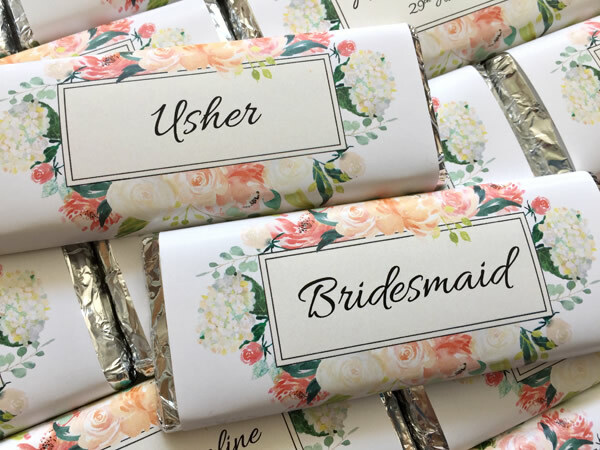 Each bar can be individually personalised with your guests' names on the front, so effectively they can double up as place settings, still with your personal thank you message on the back. These are silver foil bars, printed onto white gloss paper and are priced at £2.25 each (without cellophane gift sleeves). A great way to lift the presentation of your bars & keep them in tip-top condition for the lucky recipients. 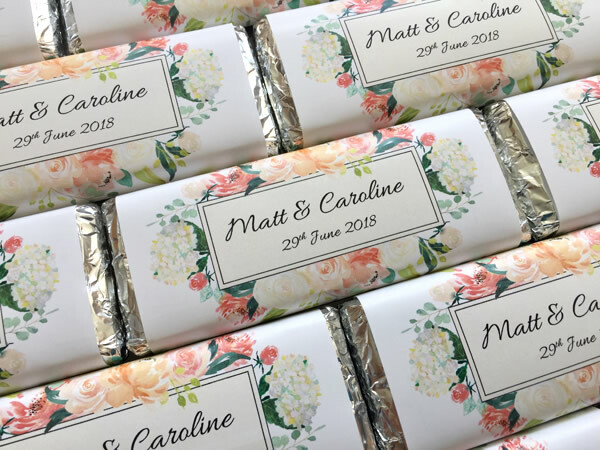 They are available at just 15p extra per bar & the chocolate bars come to you enclosed within the sleeves, ready to distribute. These are minimal increases to the unit price of each bar and will vary depending on the amount of personalisation required, as each job undertaken is unique. We have separate info sheets for our Wonka bars depending on how you would like to use them...eg as party/wedding invitations, wedding favours, individually personalised place settings, or for a fundraiser. Please contact us to discuss your exact requirements & we will then be able to quote accordingly.